An amazing trio of performers: Sarah Hughes (UK), Manfred Werder (CH) and Ryoko Akama (JP) together for a little handful of UK dates this November as they orbit the Huddersfield Contemporary Music Festival, where they are also presenting works. For this event at Fuse they will be presenting a unique score/work played concurrently, separately and partly overlapping. Artist, composer and performer Sarah Hughes (UK) produces work that explores the boundaries of interdisciplinary practice, often moving between sculpture, installation, composition and music. She is co-director of Compost and Height, and co-founder of BORE, a publication dedicated to experimental text-based and graphic scores. 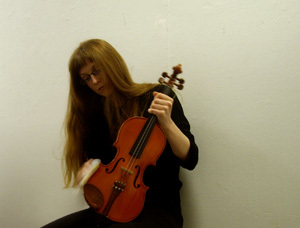 Hughes’s work has been exhibited and performed internationally, including at Supplement, London; V22, London; Sydney Non Objective, Australia; Oriel Davies, Wales; Center for New Music, San Francisco; Constellation, Chicago and The Wulf, Los Angeles. Manfred Werder (CH) was born 1965 and is a composer, performer and curator. His work focuses on possibilities of rendering the practices regarding composition and field. His recent scores have featured either found sentences from poetry and philosophy, or found words from whatever impacts. His performances, both indoors and outdoors, aim at letting appear the world’s natural abundance. Earlier works include stück 1998, a 4000 page score whose nonrecurring and intermittent performative realization has been ongoing since December 1997. Ryoko Akama is a sound artist/composer/performer whose works approach silence, time and space, exploring quiet and minimal music/situations. She performs with sine tones and objects, or creates sound installations that deal with materials, objects and phenomena. She also curates and generates projects, having worked with the University of Huddersfield and Octopus Collective, running the Melange Edition label, and co-editing Reductive Journal. Her works and projects have been funded by Arts Council England, Japan Society, Daiwa-Anglo Foundation, and the University of Huddersfield.